Similar triangles are triangles whose corresponding angles are equal. Corresponding sides are not equal. If the sides are also equal, we say that the triangles are congruent. Angles A and angle E shown in green are equal. 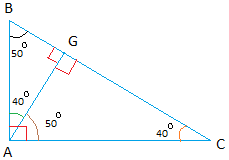 Angles B and angle F shown in red are equal. 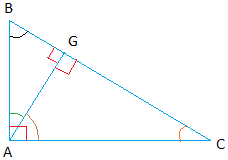 Angles C and angle G shown in dark red are equal. You don't have to have the measure of all 3 corresponding angles to conclude that triangles are similar. The traingles are still similar. The only difference this time is that angle C coincides with angle F.
A special figure that always gives similar triangles. Triangle ABC, ABG, and AGC. All 3 triangles are similar to one another. The easiest to see why they are similar triangles is to plug in some numbers.